Once again we are seeing how socialism destroys industries, economies—and lives. The late Venezuelan President Hugo Chavez and the current just-ousted president, Nicolas Maduro, have something in common with the elected democratic socialists in the U.S.: undermining the fossil fuel industry. The main difference is that wasn’t Chavez’s and Maduro’s goal. Venezuela was once one of the most prosperous and thriving countries in South America, but imposing socialism has led to an unprecedented economic collapse. One reason for Venezuela’s past prosperity is it has the largest proven oil reserves in the world: 301 billion barrels in 2017, according to the U.S. Energy Information Administration. That’s compared to 266 billion barrels for Saudi Arabia and 35 billion for the United States. Venezuela also has the eighth largest natural gas reserves. Although Venezuela produces a heavy crude oil that is difficult and more costly to extract and refine, it nevertheless managed to produce more than 3 million barrels a day before Hugo Chavez won the presidential election in 1998. Socialists always think businesses can afford to pay more. When PdVSA (Venezuela’s state-run oil company) workers went on strike in late 2002 and early 2003, Chavez fired 40 percent of them. He replaced them with his cronies—another common socialist practice—which led to further production declines. 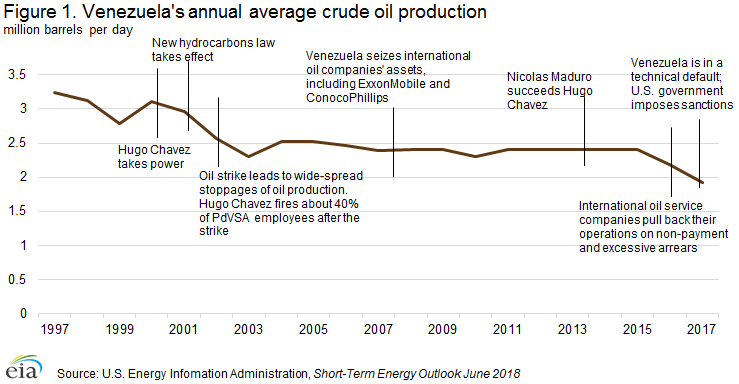 In May 2009, Chavez nationalized private oil companies’ assets, and—you guessed it—production declined even more. The heavier-handed and less-liked Maduro entered office in 2013, and shortly thereafter oil production tanked. Chavez and Maduro used their oil and gas revenues to financially prop up Cuba, pay their long list of cronies and support revolutionary mischief around the world. But the very socialist principles that guided Venezuela’s strongmen also undercut their black-gold mine. Venezuela has seen a huge reduction its oil and gas production, not because it decided to embrace the green new deal of Senator Bernie Sanders and Rep. Alexandria Ocasio-Cortez, but because the country embraced their economic policies.